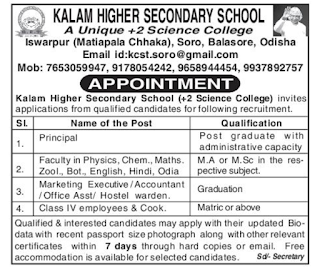 Kalam Higher Secondary School, Odisha has advertised in the SAMAJA newspaper for recruitment of Teaching Faculty- Principal, PGT, Non Teaching Faculty jobs vacancies. Interested and eligible job aspirants are requested to apply with in 7 days. Check out further more details below. Principal :post graduate with administrative capacity. Salary and other facilities is not a constraint. 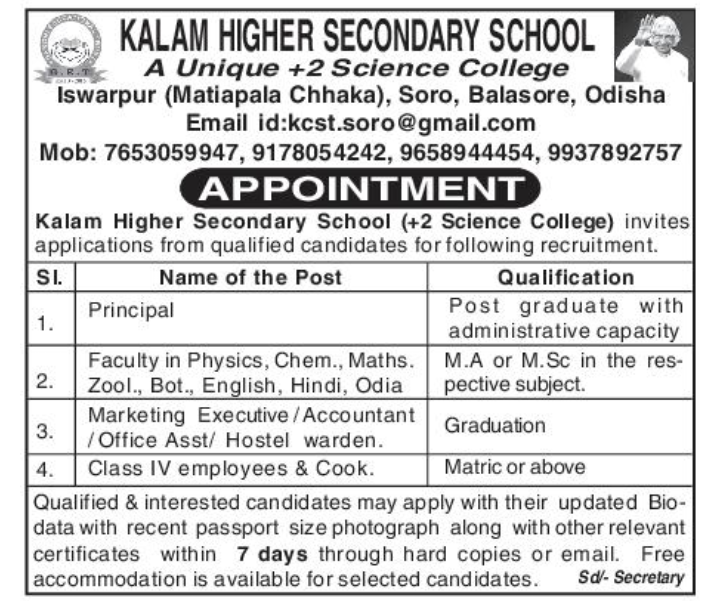 Reference: Recruitment Notification / Career Job Opportunities notice for Teaching Faculty PGT, Principal, Non Teaching Faculty on Samaja newspaper Dated 2nd July 2018.